Fans of drum corps in Las Vegas may soon have the chance to cheer on a team of their very own. 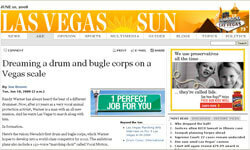 The Las Vegas Sun profiled Randy Warner, founder of the nonprofit group Las Vegas Marching Arts, who aspires to bring a competitive drum corps to Nevada for the first time ever. Warner is striving to have his corps, dubbed "Silverado," to take the field in 2010.